Houseboating is a great option for a family vacation: having a cup of coffee on the deck while watching the morning sunrise, commandeering a quiet cove as your personal water playground, catching your dinner off the back of the boat, and snuggling up in a berth for story time with the kids. It’s the stuff that memorable family vacations are made of! And it’s even better if you can share the experience with grandparents or other families. Often, even the family dog is allowed to come. Like camping in an RV, your belongings go with you; there’s no hassle of unloading the car and schlepping all your everything into a hotel or cabin. Houseboats vary in size and amenities, but most have staterooms, bathroom, kitchen, and outdoor grilling area. For added fun, I’d recommend bringing or renting tubes, kayaks, stand-up paddleboards or jet skis. And if your houseboat has a hot tub and slide, you’ll be in the running for the “best parent ever” award! 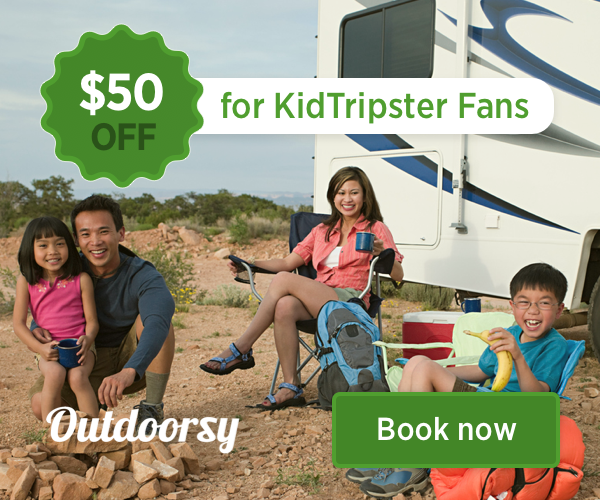 KidTripster Tip: Renting a houseboat isn’t cheap. Prices vary widely based on the size, amenities, season, and location. Boats are typically available for 3-, 5-, and 7-day trips. However, keep in mind, you can book a boat for several families to share, and thereby split the cost. Located in Central Oregon about 60 miles from Bend, Lake Billy Chinook is like no other. From the helm of your houseboat, you’ll be surrounded by 200-foot canyon walls; in the distance, you’ll have views of snow-capped Mount Jefferson. The reservoir is fed by the Metolius, Deschutes, and Crooked Rivers. The clear, deep water here is like glass, except for the jumping Kokanee that leave rings on the surface. There’s record-setting Bull Trout in the lake, too. But your kids likely will be more interested in swimming, kayaking, and paddleboarding. Cove Palisades Resort & Marina rents houseboats that sleep six to 14 people, as well as jet skis and other water toys from mid-May to late-September. Some boats are equipped with slides and hot tubs. KidTripster Tip: Cove Palisades Resort & Marina rents party barges, too, if you’re just there for a day. Click here to find out more. Extending from northern Arizona to southern Utah, Lake Powell is a mecca for houseboating. Families are draw to this lake because of the golden sunshine and red rock canyons. Consider renting from Wahweap Marina or Antelope Point Marina (South Lake) in Arizona or Bullfrog Marina (North Lake) in Utah. Choices include economy, deluxe or luxury boats from 46 to 75-feet in length, plus lots of water toy rentals. They also have several training videos online to prepare you for the experience. KidTripster Tip: If you’re looking to see Rainbow Bridge, one of the largest known natural bridges, a houseboat is not your best option. Rainbow Bridge is about 50 miles from Wahweap Marina; that’s a long journey in a houseboat not to mention the amount of gas that’s needed. Navigating the windy canyon and boat traffic will likely take more skill that you’ll have as a novice captain. Plus, docking space for houseboats is scarce during popular months. I’d only attempt a visit here in a run-about boat, if you have one, and only if you’re on a week-long trip. Situated in a remote area of Northern California, Shasta Lake is a popular destination for families looking to experience nature. Here you’ll find an abundance of wildlife, including bald eagles, black bears, and cougars. And if you’re looking to catch your dinner, you should have no problem; bass and trout are abundant. In the summer, you’ll find the water clean and refreshing, perfect for swimming, tubing or paddleboarding. 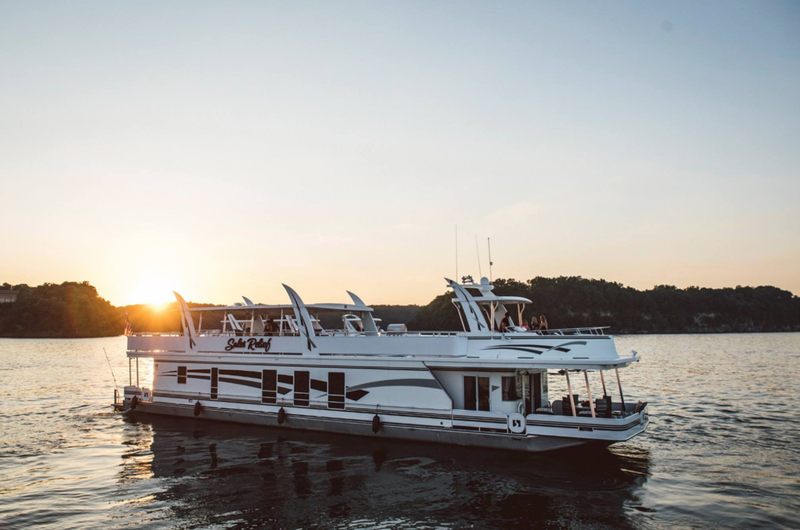 Jones Valley Resort offers of variety of houseboat rentals, including the Titan, a luxury three-decker boat with its own hot tub and spiral tub waterslide that sleeps 22 people! Rentals also are available at Bridge Bay Resort and Silverthorn Resort. Located in heart of Missouri, Lake of the Ozarks is a serpentine reservoir covering 54,000 acres with 1,150 miles of shoreline. Nicknamed “The Magic Dragon,” this lake is well known for both boating and fishing. You can motor your houseboat to one of the popular “party coves” or find a quiet corner all to yourself. Ozark Yacht Club rents a luxury houseboat that sleeps eight. You also have access to the club’s heated pool, beach, and fitness center. For a wider selection, try Lake of the Ozark Houseboats. Formed by Hoover Dam and located on the Colorado River, Lake Mead is the largest reservoir in the USA. It’s a short drive from Las Vegas to the nearest shore, but the lake itself is large at 247 square miles. 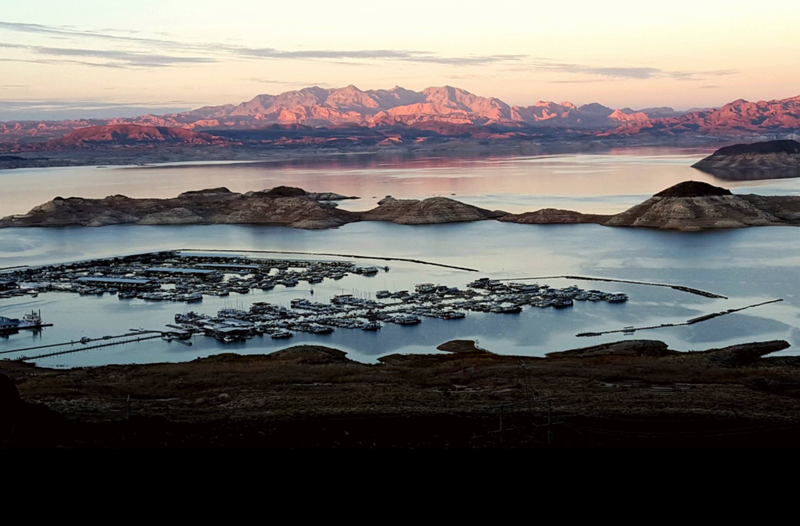 The Lake Mead National Recreation Area is surrounded by jagged mountains and boasts stunning sunsets. Callville Bay Marina rents six different houseboat models, ranging from 50 to 75-feet in length. KidTripster Tip: Make time to visit Hoover Dam (by car, not boat) and take the tour. Lake Cumberland is one of the country’s top houseboating destinations. Situated in south central Kentucky, your family will love exploring the thousands of coves that this lake has to offer. Jamestown Resort & Marina and Beaver Creek Resort offer houseboat rentals on the lake, as does Burnside Marina farther down the Cumberland River. Rentals occur April through October. 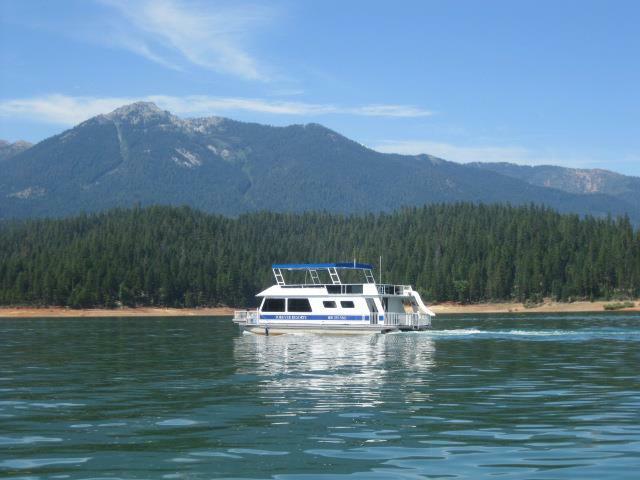 Surrounded by evergreen trees and sandy beaches, Dale Hallow Lake is a houseboating haven. Anglers flock here for the smallmouth bass fishing; the lake boasts the record for the largest one ever caught. But you don’t have to be an angler to enjoy the lake’s glassy water; water sports also abound. This reservoir is located on the Tennessee-Kentucky border about a two-hour drive from Nashville. East Port Marina & Resort, Mitchell Creek Resort, and Sunset Marina & Resort all offer rentals; most of the houseboats come equipped with their own waterslides. If you’ve ever met folks who have boated on Lake Ouachita (pronounced WASH-i-taw), they’ll likely insist that this is the most beautiful lake that they’ve ever seen! I do know that it’s one of the cleanest lakes in the country with clear waters perfect for snorkeling. Scuba divers come here to see one of the largest crystal veins in the world. The waters are also home to rare non-stinging jellyfish, sponges, and the best striped and largemouth bass fishing in the country. Lake Ouachita boasts a pristine coastline with no homes or businesses, just a state campground, and nearly 200 islands for houseboats to drop anchor. While it’s an incredibly popular spot for boating, it never feels crowded. Explore by kayak or motor your houseboat along the Geo-Float Trail that takes in all the prominent geologic features. A short drive from Hot Springs, you’ll find four houseboat rental companies on the lake: DreamChaser Houseboats & Water Toy Rental, Wake Zone Luxury Houseboat Rentals, Almost Home Houseboat Rentals, and Lake Escape Houseboats. Houseboating is an unique family vacation, but renting a canal boat and navigating the Erie Canal - that’s memory-making for sure! The Erie Canal stretches 365 miles from Albany on the Hudson River to Buffalo on Lake Erie. The folks at Mid-Lakes Navigation rent Lockmaster canal boats for trips from two days to a full week. They’ll show you the ropes and even provide bikes, so that you can explore the small towns along the way. Because of the nature of this trip and the tight quarters, it’s better suited to older kids. Located in the Shasta-Trinity National Forest, Trinity Lake is far quieter than its popular neighbor Shasta Lake but no less beautiful. Here you’ll find secluded coves, sandy beaches, and opportunities for hiking, fishing, and water sports galore. Trinity Lake Resort & Marina rents houseboats from 50- to 60-feet long that accommodate six to ten people. Editor Shellie Bailey-Shah grew up on the water in Michigan, where she learned how to drive a boat before a car.